Every time I try to make something with zucchini, my success is somewhat limited. The fact that I am not a fan might have some saying in this as well but to be honest, they don’t really go that well with pretty much anything. Well, sort of… they were delicious when used instead of noodles like I did in my only other zucchini recipe, but that was probably a one time idea since I am not a vegetarian. Still, I like to eat according to my mood as much as possible and every now and then I find myself craving for some of my childhood family dishes (don’t we all!). My mom used to make a delicious zucchini soup back in the day and I often find myself trying to replicate some of her awesome dishes. There are few additions to the original recipe but nothing major though, adding celery stalks, sweet peppers and some paprika is something that I use in almost all my soups anyway. Also the soup is sour and if you know what is best for you, you will try to keep it this way. In one of my previous posts I mentioned how to get your hands onto the most important ingredient required by the Romanian sour soups and though it is way different than the organic, home-made thing that my mom used to make, now is a pretty common replacement. However, if you cannot find any “Bors Magic” or you want to make the soup as close to organic as possible, you can always use lemon juice. Hope you all have fun and enjoy this great recipe. Clean and chop all the veggies, piece size can be as big as you want but I like mine tiny so I shredded most of them except the peppers, zucchini and onions obviously.. Using two to three tablespoons of vegetable oil, saute onion along with sweet peppers, carrot, parsnip, celery root and those pieces of celery stalks for around 5 minutes. For this procedure you can use a pan of your choice or use the soup pot. Add sauteed veggies to your soup pot and pour 2 to 3 qt of water (around 3 L), salt and pepper to taste and a bit of sweet paprika (a tablespoon at the most). Bring to a boil then reduce on medium heat for another 20- to 30 minutes or until the veggies are almost done. Add chopped zucchini and Bors Magic, bring to a boil again turn to medium and cook for another 10 to 15 minutes. Bors magic thing says 1tsp per litre of soup but three teaspoons might be too much to the whole quantity. Add just two at first, wait for a couple of minutes, taste and add more if required. I like mine pretty sour. Meanwhile, in a separate bowl mix sour cream and egg yolk and slowly add a ladle of the hot soup and continue mixing so the sour cream won't curdle. When zucchini is done, remove soup from heat, add the egg/sour cream mix and a generous amount of parsley, cover with a lid and let rest for 10 to 15 minutes. Is there a substitute for Bors Magic? I know I can buy it online, but cannot find an ingredients list for the package and we have food allergies to be aware of. Could I substitute lemon juice or cider vinegar? Lemon juice is just fine and any other herbs you usually use in a sour soup. My mother made a green bean soup that was similar to this. Could I substitute green beans for the zucchini? 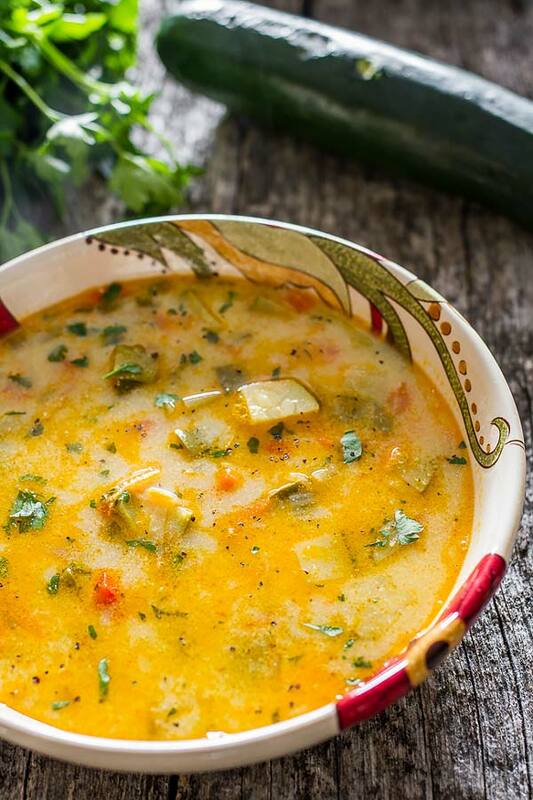 Or do you have a recipe for Romanian green bean soup? Green bean soup is not something that I tried before. To be honest I don’t even know anybody that makes it and while I don’t care much about green beans, it might be an interesting combination nonetheless. Given that, swapping vegetables around in any kind of soup should be OK. Let me know how it was, if you didn’t already make it. Chop the onion and the garlic, sautee în oil, add chopped carrot and celery root, add water, green beans, salt, pepper, sweet paprika, bring to boil. When vegetale are alost Done, add chopped tomatoes, yoghurt, vinegar. Bring to boil. Add chopped lovage and parsley. Enjoy! Definitely on my to do list. Thanks! It is a soup seasoning. There is a link here: http://www.cookingglory.com/recipes/meal-ideas/soups-stews/meatball-sour-soup/ but makes the soup sour so if you are not a fan, forget it. Anyone who has substituted lemon juice, how much have you used? Is the “Bors Magic”like sour salt?